Scientists now think that the Moon was formed when a Mars-sized object crashed into our planet about 4.5 billion years ago. The collision was so large that a huge spray of material was ejected into space. The orbiting ring of debris gathered itself into a sphere, and formed the Moon. How do we know that this is how the Moon probably formed? 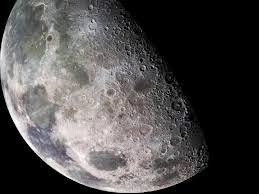 The Moon seems to be much less dense than the Earth and lacks a lot of iron in its core. Scientists think that the Moon is made up of the upper crust material, which has mostly lower density, than the composition of the Earth. Although the orbit of the Moon seems nice and stable, our only natural satellite is actually drifting away from us at a rate of 4 centimeters a year. This is happening because of the conservation of momentum in the orbit of the Earth. In about 50 billion years from now, the Moon will stop moving away from us. It will settle into a stable orbit, taking about 47 days to go around the Earth (it takes 27.3 days today). At that point, the Earth and the Moon will be tidally locked to each other. It will look like the Moon is always in the same spot in the sky. Of course, the Sun is expected to consume the Earth in about 5 billion years, so this event may not happen.